Lead feeding has probably been the biggest change in dairy cow nutrition in the last 20 years but when people talk about lead feeding, they too often concentrate on anionic salts and milk fever prevention. Milk fever prevention is only a part of a full lead feeding program. With current prices, we need to provide the most cost-effective way of maximising productivity. Cutting corners at the expense of animal health may cost you money in the long term. Supply an anionic salt to the springer cows. A cheap, easy way of doing this is to add Mag C to the drinking water of springer cows. We have been selling Mag C because we find it is easy to use and has a large impact on milk fever and associated diseases. More effective but also more expensive anionic salts are available in pellet form from various companies. Feed some concentrate to cows before calving to allow the gut to adapt and to supply energy. Springers should not be fed grain containing bicarb because of the increased risk of milk fever. Supply diets high in energy and protein after calving. Supply extra calcium to both springers and milking cows. This can be done by adding 100grams of limestone per day to the milking cow grain or using a product such as Macrovet E. Springers can be fed half this amount. Avoid grain overload problems by introducing grain to the springers, supplying sufficient fibre in the diet and using rumen modifiers such as Eskalin. There are 3 main conditions we wish to avoid. In the past, milk fever prevention relied upon feeding grass hay to springer cows. This still often works; however, by using anionic salts, we are now able to reduce the incidence of milk fever and other problems while still supplying the cow with a high quality diet. Anionic salts also help prevent some of the problems associated with subclinical milk fever (where cows appear relatively normal but have low blood calcium). Problems include retained afterbirth, slow or reduced rumen function, displaced abomasum and poor milk production. Reproductive performance will also be improved e.g. the InCalf study has found that farms feeding anionic salts had improved fertility. Anionic salts work by making the cow’s blood more acidic and thus more able to mobilise calcium from the bone. This is why feeding hay helps. Hay stimulates cows to salivate more. Saliva contains negative ions which are absorbed through the rumen wall into the bloodstream. When the cow needs calcium at calving it is then available. The many anionic salts available on the market have differing effects on blood acidity and thus milk fever prevention. The ability to acidify the blood is measured by DCAD (dietary cation-anion deficit). The choice of anionic salt will depend upon farm management, degree of a problem (determined from farm records), costs, other feeds being fed and the ability to feed different supplements to springers and milking cows. In most situations it is expensive and unnecessary to feed anionic salts to milking cows. We have found Mag-C (magnesium chloride) administered by a peta dispenser in the drinking water to work very well in preventing milk fever when combined with extra calcium in the diet. Other feeds, especially those high in Potash (Potassium), can increase the chance of milk fever and decrease the effect of the anionic salt. Paddocks used as night paddocks and those used to calve cows are often high in potash. Feeds and pasture can be tested for DCAD and the risk of milk fever can be estimated from the DCAD value. Hay for the springers can also be tested. Urine pH:We have a pH meter which accurately measures urine pH. This gives an indication of blood acidity. To prevent milk fever the goal is for urine pH to be 6.2 to 6.8 (Friesians) and 5.8 to 6.2 (Jerseys). Testing urine pH is cheap, easy and should be done! Blood Calcium: We can also measure blood calcium on some cows after calving to see if they have subclinical milk fever. DCAD measurement of feeds: If you do not check the base feed, you could be wasting your time feeding anionic salts. High potassium in base diets will “neutralise” the anionic salt. Extra calcium is also important! As well as changing the DCAD of the diet (which changes the pH of the blood), we want to add more calcium to the springer diet. If the DCAD of the diet has not been measured or altered with anionic salts, extra calcium should not be added as more milk fever may result. 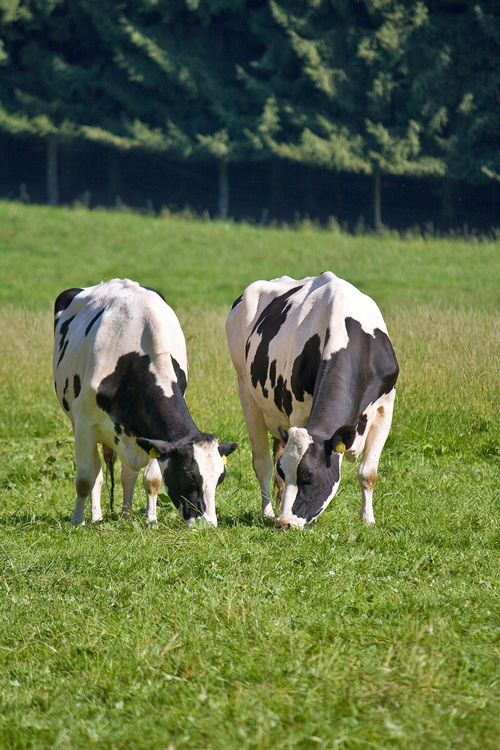 If anionic salts have been used, extra calcium is important in the milkers’ diet. Extra calcium can be given by adding limestone (100grams per cow per day) to the milker diet or by including a feed additive pellet. Many additive pellets do not contain enough calcium to be effective. For this reason, Warrnambool Veterinary Clinic has formulated MACROVET. Ensuring adequate magnesium is also essential to milk fever prevention and helps to preventing grass tetany. The rumen of the cow is the organ which really drives milk production. To increase production and profitability we want conditions within the rumen to be stable after calving. Stability means that the acidity of the rumen does not alter too much. Stability is increased by adapting the rumen to the diet that will be fed after calving. This is done by introducing the milker diet to springers before calving. Adding supplements to the springer diet will also do this and additionally, provides energy and protein. Bicarb soda should not be fed to springer cows as it will increase the chance of low blood calcium. Eskalin is the most effective product to minimise acid build up and does not increase the chance of milk fever. This is the reason Macrovet E contains Eskalin. If grass and grain make up a large part of the diet, cows may also be deficient in fibre, making grain overload problems more likely. Fibre content of the diet is also important to reduce the incidence of displaced or twisted stomachs. The effects of grain overload are not always easy to detect. Mild acidosis may decrease dry matter intake by 5 to 10% without making the cow obviously sick. On the other hand, severe grain overload can cause rumen damage, liver abscesses and damage to lungs and blood vessels. Cows close to calving need feed high in energy and protein. Most springer diets in the past have been high in fibre and low in energy. Cows close to calving have depressed appetites (by 10 to 30%) and this is further decreased if the diet is mainly rough hay. These 2 factors make it easy for cows to either go down with pregnancy toxaemia before calving or develop acetonaemia after calving. We see pregnancy toxaemia in cows that are in light condition prior to calving or have limited feed supplies. Large calves and twins also make cows more likely to go down before calving. Springer cows need some high energy and protein feed to satisfy the demands of the calf as well as getting ready to calve. In the last few weeks of pregnancy, the calf can be likened to a parasite which grabs large amounts of energy and protein from the cow e.g. in the eight month of pregnancy, the calf requires 25MJ of energy (the equivalent of 2kg grain) e.g.2 in the last few weeks of pregnancy, the calf requires 43MJ (3.5kg grain). Unless we feed the cow to allow for this, her production once she calves will be decreased. In summary, in the last 3 weeks of pregnancy, the cow has large demands of energy and protein. Feeding the cow a transition diet which satisfies these requirements allows the rumen to adapt to a new diet, reduces the risk of metabolic problems and sets her up for a happy and productive lactation. If you would like information on feeding strategies for springer cows feel free to contact on of our vets.